It was another nice, quiet, and peaceful day at the Masaki residence. Tenchi was working at the fields, harvesting carrots for Ryo-oh-ki. Aeka and Ryoko were engrossed in a Korean drama on TV. 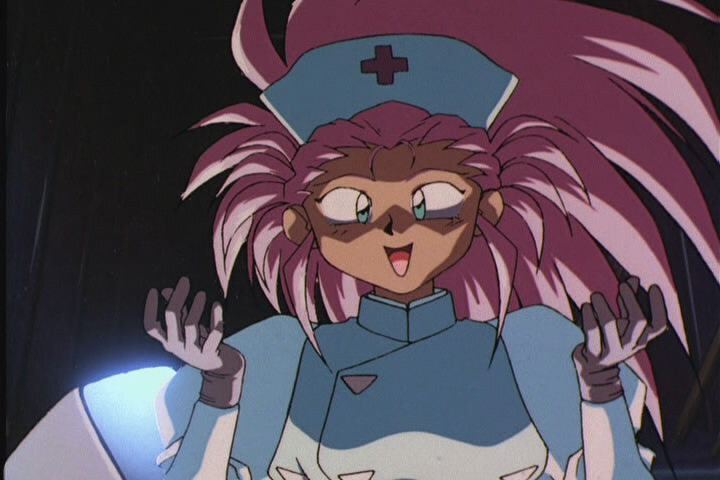 Mihoshi was off doing her own thing. Sasami was busy preparing Tenchi's o-bento (lunchbox) and Washu hasn't come out of her room since morning. A moving truck was seen going past the house into the woods. "Hm? New neighbor?" wondered Ryoko out loud as she watched the car drive pass their house out of the corner of her eye. Indeed, there was a car behind it, with a red haired driver, Caucasian features. "Mmmm...." mumbled Mihoshi as she turned to her side on her bed, book still in hand. After a meal she had wandered up to her room to read another chapter of The Hungry Game, a novel that had been all the rage in space some years ago, flying off the shelves. She had been so engrossed that she had fallen asleep, perhaps daydreaming a mix of her Galaxy Police work and the novel's contents. That's when she heard a large "VROOOOM" sound outside from the street that cuts by the house, which was successful in waking her up somehow. She sat back up, dropping the book to the floor and rubbing her eyes. "That was a nice nap..." she commented with a yawn, then fretting, "Oh no, I've lost my chapter." Then her eyes drifted to the trees outside, noticing that it had started raining. The rain continued to fall on the Masaki residence. "It started raining." said Ryoko, looking outside. "Indeed it is." replied Ayeka half-halfheartedly , too engrossed in the kissing scene on TV. "Oh!" she said, her hand reaching out for the cookies. "Hmm...." Ryoko pushed the bowl away and handed her Ryo-oh-ki. The men were now unloading the stuff into the log cabin he had purchased. His years with Spetsnaz treated him well, but he was sick of the military scene, and wanted to live his life in peace. He had a nice two room, two floor log cabin in the woods near a lake, looking like an American pioneer's home, but with all the modern conveniences, a firing range in the back, and plenty of time to hike and hunt if he wanted. The rain was disappointing as the men rushed in and arranged his furniture, but once they were done and the van pulled away, he grabbed some coffee and sat under the roof of the porch and enjoyed the range. This would be a nice quiet life. "MIHOSHI! Why are you still sleeping?!" exclaimed Noike, agitated at the blonde after calling for her repeatedly. Book still on the floor the woman sat up again, yawning again, noticing the teal haired woman in her room. "Wha... What is it, Noike?" wondered Mihoshi with her airheaded mannerism, looking up at her. They had been partners, and now were housemates, as she was Tenchi's fiance. The woman sighed, wiping her brow, "You could be downstairs helping with chores. Ayeka and Ryoko are helping to. There's dishes to be washed, potatoes to peel, futons to change...."
"Oh... those chores. Sure thing," agreed Mihoshi, stretching her arms and standing up. She had become a tad lazy since living here, but kept her figure; tight body, tan skin, long wavy blonde hair pulled back in her signature red hair-tie. She had on her usual tan khakis and a pink tank-top. "Don't worry about today, for tomorrow is sure to bring roses of blue and sparks of new. Threads will always wear thin before they snap." The blonde shrugged her shoulders, not thinking much of it as she turned off her computer and hurried downstairs to help. The rain had begun to slow to a mist. At this, the moving van again past the house back the other way, but without that car in tow. "Guess I'll go say hi." said Ryoko as she floated out of her chair and toward the ceiling. tttccccchhhhhhh and she dissappeared, teleporting to the outside. "Hmm.... I think he went this way...." Ryoko muttered to herself as she held her hand to her eyebrow. He sipped his coffee contentedly, loving the quiet he so admired of the forests back home. "Hi there!" called out a voice from above. There floated a spikey white haired girl in mid-air. He set down his coffee and started to look around on the ground, hearing a voice but seeing nothing. "Up here. You new around here?" said Ryoko, waving down at him. "GAAAAHH!" he shouted, almost falling backwards out of his chair.